general term for any worker engaged in making ear trumpets or other instruments used by deaf persons; cuts sheet metal to shape, with shears or knife; sometimes also uses lathes and drilling machines, and various tools, in shaping metal parts; beats sheet metal round a mould with a hammer, and sometimes also brazes it to form trumpet; cuts and shapes, if necessary, on lathes and drilling machines, vulcanite or other parts, but these are usually supplied ready-made and finished; fits together metal and vulcanite or other parts, with hand tools; work varies greatly according to type of instrument, but in many cases resembles that of telephone maker (309) q.v. sews together with sewing machine, parts of anatomical appliances, e.g. trusses, surgical belts, coverings for irons. hollows out, with hand-carving tools, wooden parts of artificial limbs; makes joints and fixes them with small pins; covers parts of limbs by glueing on leather sheaths; fits in special "Bowden'' wire to movable joints to enable wearer to operate them; assembles and fits together all parts oi limb. instructs orthopaedic instrument maker q.v. as to measurements of instruments, and is responsible for correct fitting of instruments; often consults with surgeon and receives instructions as to measuring and fitting; often also examines and measures deformed person for instruments where it is not essential that this should be done by surgeon. receives measurements and instructions from orthopaedic instrument fitter q.v. ; forges steel bar or strip, if necessary, by hammering it on bench fitted with a vice, to make rods of appliance or to make racks, if these are required; hammers rod or strip to shape; fits it up on a lathe, e.g., turning, drilling, screwing, cutting, shaping, or by scraping or filing; attaches small parts and assembles parts to form complete instrument; hardens and tempers instrument; passes to polisher (238) q.v. ; sometimes pads instruments, by wrapping them with felt and stitching on a leather cover, by machine; sometimes makes splints, by heating plastic felt and moulding it to shape on limb, or by dissolving celluloid in acetone and applying this in coats alternately with several layers of gauze, the whole setting firmly to form splint; is able to shape instruments to fit and support deformities of hip, spine, limb, etc. makes frames of respirators from wire and stamped metal, and sews fabric thereon. (ii) makes splints, for stock, of metal, but does not make to specification; stamps out metal parts in a power press; forges joints and hardens and tempers them; sometimes turns parts of splints. general term for any worker engaged in making surgical appliances; includes wood workers, leather workers, and steel workers. an anatomical machinist q.v. who sews anatomical or surgical belts by machine or by hand. 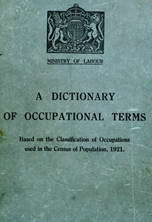 (ii) general term covering workers in surgical appliance trade, including orthopaedic instrument maker, splint maker, blunt worker (682), and sometimes also surgical instrument maker (682) q.v. a surgical belt maker q.v. engaged in sewing, by machine or by hand, leather or fabric covers of hernia trusses. makes surgical trusses, of steel; cuts steel strip, drills and rivets; covers with padding of wool or hair and leather or cotton fabric; cf. truss coverer.